Tear gas was the first chemical weapon to be used. It was a non-fatal irritant, and the first to use it in WW1 were the French, who used 26mm grenades filled with the gas (ethyl bromoacetate) on August 14th, 1911. The next to use it were the Germans, against the British. 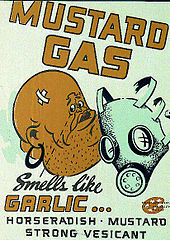 Mustard gas was the most widely used, and possibly the most effective, chemical weapon in WW1. It was first used in Germany, in July of 1917. Although it usually wasn't fatal unless the victims were exposed to extremely high doses, exposure to mustard gas was extremely painful, and caused blistering, vomiting, and possibly internal bleeding. First synthesized in 1812 by Sir Humphry Davy, Phosgene gas followed on the heels of Chlorine gas. It was more potent than Chlorine gas. Although it was deadlier than Chlorine gas, it's symptoms sometimes took up to 48 hours to manifest. It caused suffocation. Although it was initially used by the Germans, over the course of the War both the Allies and the Axis used it. Chlorine gas was a killing agent first employed by the Germans. It was used at the second battle of Ypres in 1815. To the French, the Chlorine gas appeared as a slow-moving yellow green cloud. It was a pulmonary irritant, and acutely affected the upper and lower respiratory tracts. Of the 70,552 American soldiers poisoned with various gases in World War I, 1843 were exposed to chlorine gas.